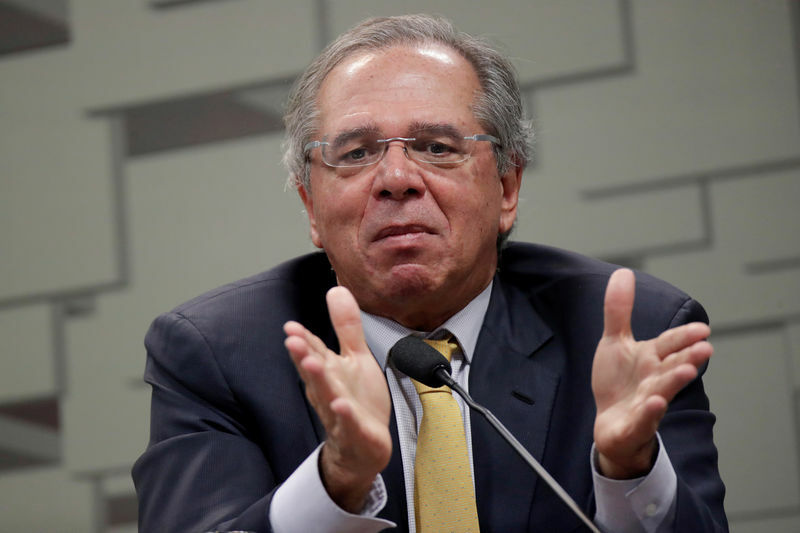 (Reuters) – Brazilian Economy Minister Paulo Guedes said on Wednesday he is “optimistic” that Congress will pass a pension reform bill that will generate savings of 1 trillion reais ($261.68 billion) over 10 years, in line with the government&apos;s ambitious proposal. Guedes is also confident Brazil will exceed its 2019 privatization goal of raising $20 billion from the sale of public assets by as much as 40 percent, he told a conference in New York, without giving any detail on which sectors or assets. Brazil was expected to return to high growth rates “very soon,” Guedes said, even though growth in the United States and across the rest of the world is slowing. Key to that is pension reform, the government&apos;s flagship economic policy to slash public spending, restore Brazil&apos;s finances and revive growth, despite increasing signs that the process is running into political quicksand. Lawmakers know they are “in a corner” and need to cut spending on pensions and change the system to private retirement accounts from the current “pay as you go” framework, he said. “I&apos;m optimistic, I think Congress will vote with us. They (lawmakers) will cut something here, something there, but I think we will get 1 trillion, which is exactly what we wanted,” Guedes said, referring to the proposed savings over 10 years. Analysts and investors overwhelmingly say that the final savings generated will likely be below that, with the consensus estimate settling around 600-700 billion reais. Guedes said that the government&apos;s proposals are widely supported by ordinary Brazilians, although a DataFolha poll on Wednesday showed that 51 percent of Brazilians are against them. Guedes and President Jair Bolsonaro have been accused of not being fully committed to building the political bridges in Brasilia required to get Congress onside. Guedes&apos; appearance at a Congressional hearing on pension reform last week descended into angry finger-pointing, shouting, insults and jostling. The minister&apos;s bullishness on social security reform also extended to other areas of the government&apos;s economic agenda. Privatizations this year will exceed forecasts, taxes are being cut and simplified, and regulations reduced, Guedes said. Privatization proceeds so far this year have reached $12 billion, more than half the $20 billion forecast, and the government will ramp that up in its four-year term, he said.